I didn’t imagine Bali to be this huge island where you need to drive an hour or so in between temple runs, within the same village. I was thinking all the while that our nine-day jaunt was too short. Planning a two-month long trip is really challenging and for our ASEAN Summer Loop trip, we did some research on the general stuff like the key cities we wanted to explore and the things we’d probably do there, and that’s it. 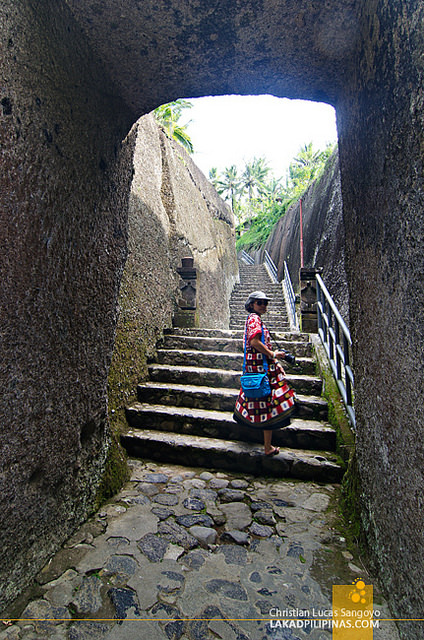 For the Bali leg, we arranged our accommodations first and planned our day-to-day roves on the day itself (check here for discounted tours, transportation and activities in Bali). Being the best travel researchers (naah), we solely relied on our moods which dictated our route every day. Like, I just wanna chill today or No trekking please or Let’s just do two temple runs today. Well, that’s just us, it’s always nice to have some prepared itinerary before you go on trips (if you’re keen on this). 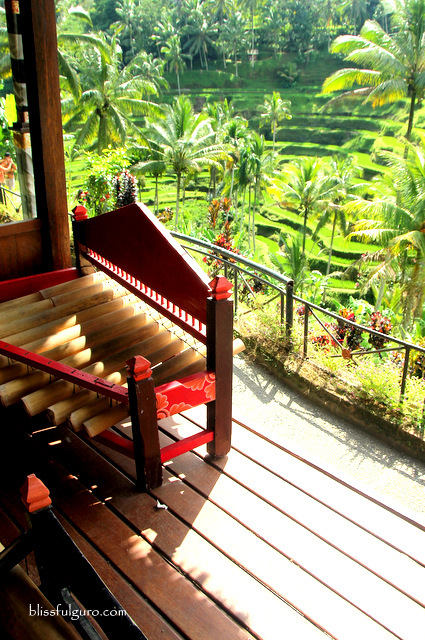 For accommodations, we planned to stay at Kuta first then transfer to Ubud and then Semiyak for the last few days. For the tours, we emailed different tour operators in Bali and found out that Bali Golden Tour was the most flexible from the rest. We did tweak some of their prepared itineraries and they approved of it with some suggestions too. Our first two days were spent on Rama Beach Resort and Villas in Kuta. 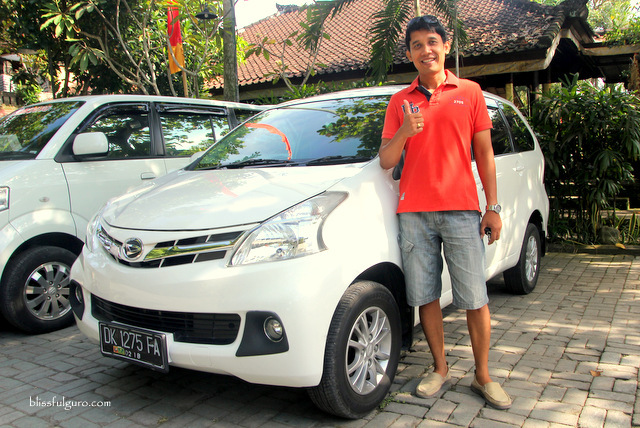 On our third day, we started our trip around Bali and since we’re staying in Ubud at that time, we started there first. 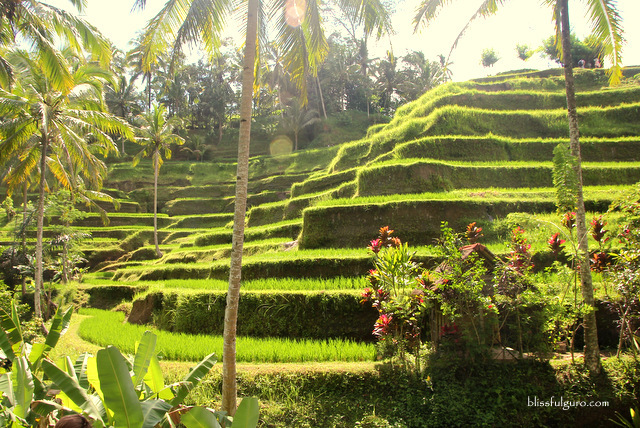 Located in Central Bali, Ubud is fast becoming the cultural center and art hub of Bali away from the beach party crowd scene in Kuta. 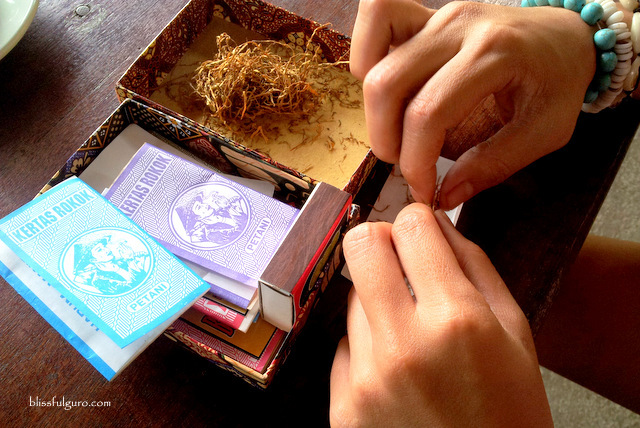 It is famous for its arts and crafts from different villages and you could see it on the artists’ workshops and galleries that lined the streets of Ubud. We met our lovely English speaking driver/guide for the next five days at Bebek Tepi Sawah Villas, our home in Ubud. His name was Made Palguna. Apparently, there are four common names that are being used in Bali depending on the order of birth. Regardless of the gender, the firstborn is named Wayan (or Gede and Putu), second is named Made (or Kadek), third is named Nyoman (or Komang), and fourth is named Ketut. The cycle repeats itself if a family has more than four children. So you would definitely know the birth order of everyone in Bali and that Wayan can marry Wayan and they would name their firstborn Wayan. I digress. Moving on, Made repeatedly asked us on our preferred itinerary but we often told him to just surprise us. Confused, he just did the basic Ubud and Kintamani tour on our first day. We first dropped by at a money changer in Ubud (US$ 100 = 1,293,500 Rupiah | April 2015) and exchanged some moolahs (we always bring cash rather than withdrawing from ATM machines). First stop was the Tegalalang Rice Terraces. 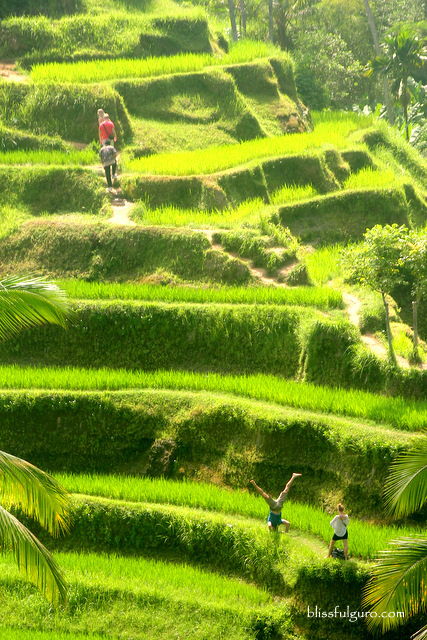 Located at Tegalalang village on the northern side of Ubud, the verdant terraced rice fields is one of the major tourist spots on this side of Bali. 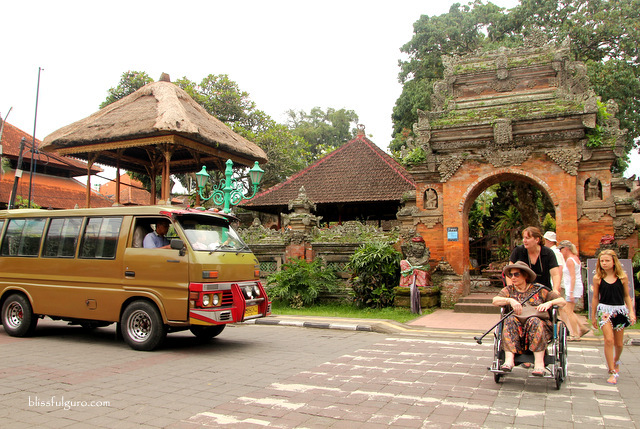 We paid 15,000 Rupiah (US$ 1.13) for the parking fee. There are no entrance fees when you want to go hiking at the rice terraces, though donation boxes are everywhere for its upkeep. We passed through some roadside restaurants that offer a nice view of the terraced fields. We weren't hungry yet so we went straight to the hillside to see the rice terraces up close which is very reminiscent of the Banawe Rice Terraces in the Philippines. We hiked down to the bottommost part and contemplated whether to continue with the hiking or not. My buddies decided to remain where they were and started taking some snapshots on that side while I continued all the way to one of the terraces. As I explored the rice fields, I suddenly tripped and fell on one of the rice paddies leaving my right leg stuck on the mud. I did get to pull back my leg but sadly, my slipper was buried in the muddy ground. I scrambled to get the slipper using my hands and after a few minutes I got hold of it, my arms all covered with mud. I went back to where my buddies were and noticed that they were all laughing. Everyone, including other tourists, witnessed the fuss I did. I let them enjoyed that moment of pleasure and smacked them on their faces right after, well no, I wish. On our way to our next stop, I noticed how intricately designed the houses and temples were that it left me glued on the car windows. 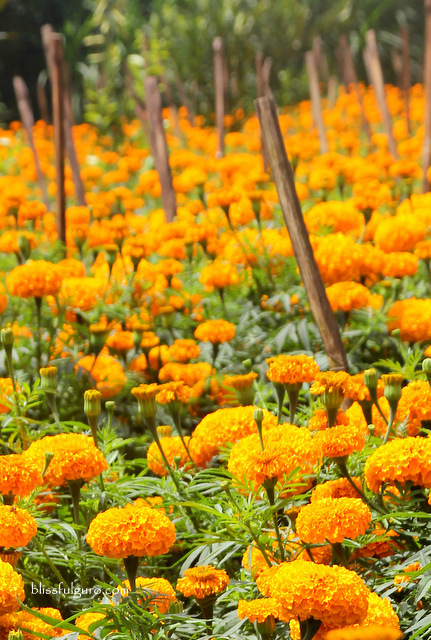 We also passed by some flower and orange plantations then requested Made for a quick photo stop. He happily obliged. 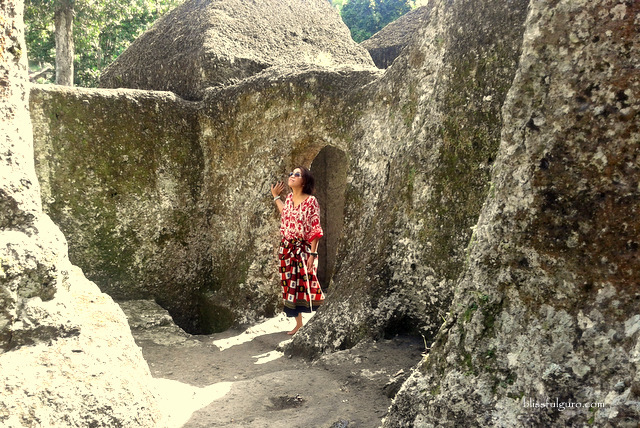 It was around noontime when we arrived at Kintamani Village and we paid an entrance fee of 30,000 Rupiah each (US$ 2.25) and 5,000 Rupiah for the car (US$ 0.38). At 1,500 meters above sea level, it was quite noticeable that the weather here is cooler (15 degrees cooler than on the coast). We stopped at Penelokan (means a place to look) and were all stunned by the nice view of Gunung Batur (Mount Batur) and Lake Batur. 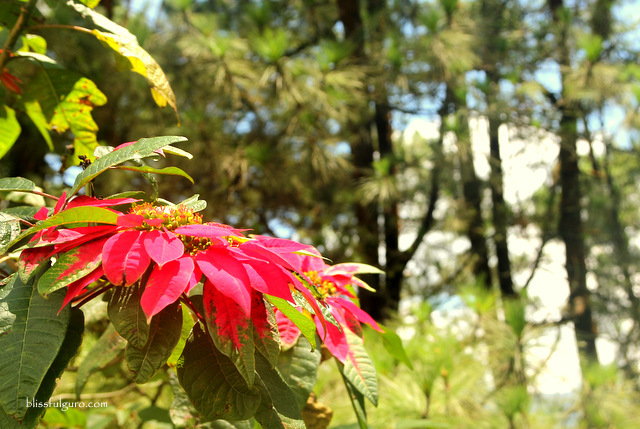 With the lush pine trees and Poinsettias around, this place is reminiscent of Baguio City in the Philippines. 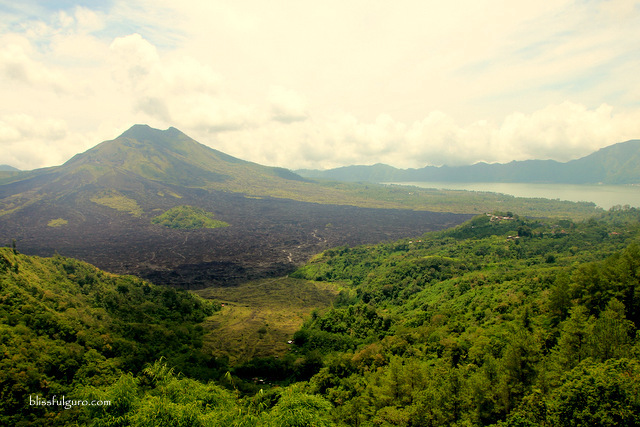 Restaurants and cafés lined the road offering a nice view of Mount Batur. But take note that food costs here can be very steep. Our next stop was the OKA Agriculture farm. 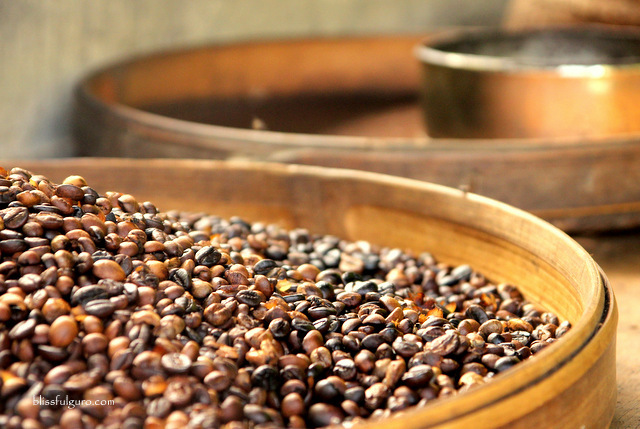 We paid no entrance fee and were guided on a little tour on a small coffee plantation and then the coffee roasting area. A tea and coffee tasting session followed after. We were given seven different cups of tea and coffee samples. I asked the guide to not disclose the said flavors and asked my buddies for a blind tasting game. After an intense debate on the said flavors, we got everything right on our first try. 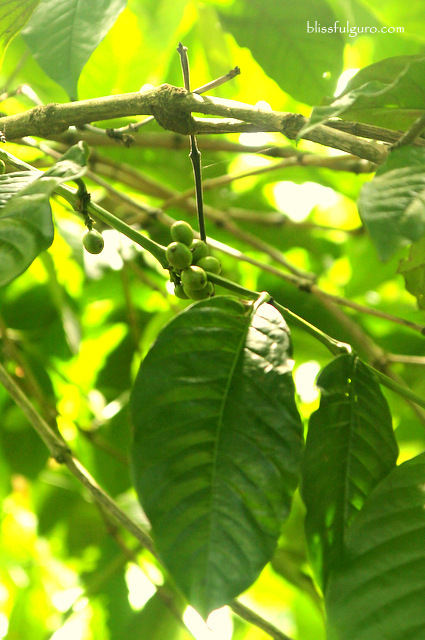 We loved the Lemon Grass Tea and the Coconut Coffee. 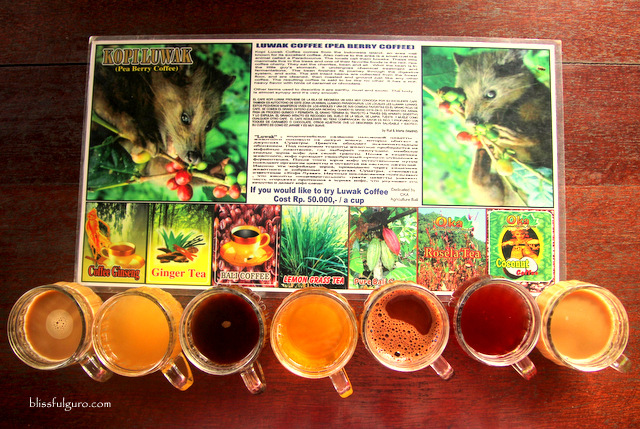 We also wanted to try the famous Bali’s Luwak Coffee (Civet Coffee) but were taken aback with its 50,000 Rupiah price tag (US$ 3.75) for a small cup, maybe next time. For our last stop, we asked Made to show us an important Buddhist temple in the area. 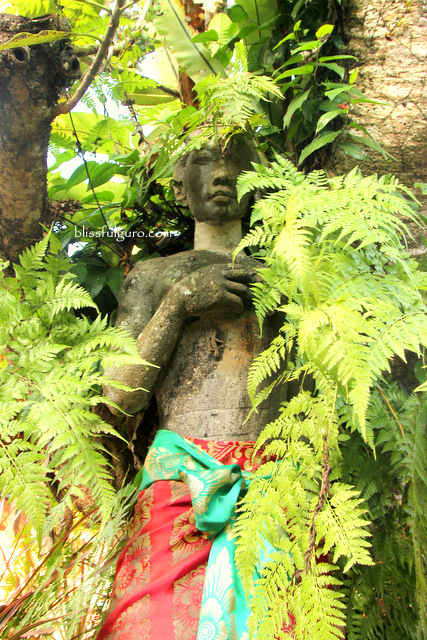 We then headed to Tampaksiring on the northeastern part of Ubud and went straight to Gunung Kawi (Mountain of Poet). 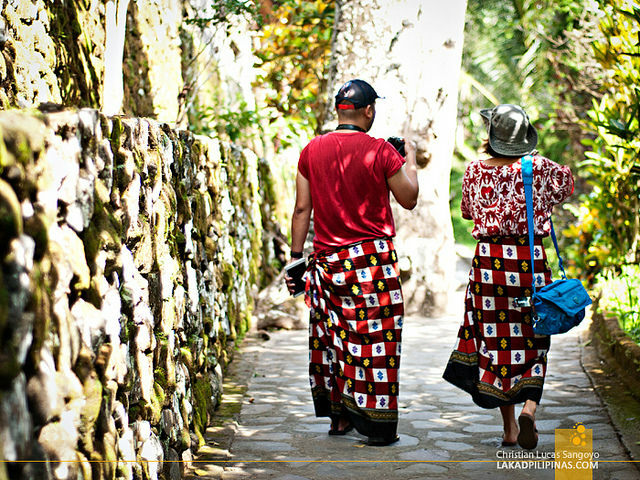 We paid 15,000 Rupiah each (US$ 1.13) for the entrance fee. 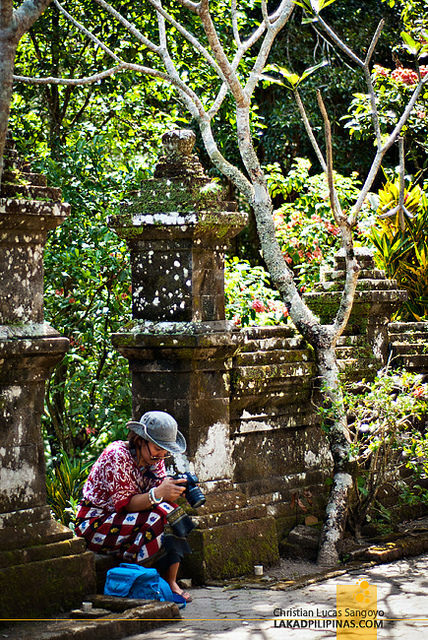 A sarong was also provided to cover our bare limbs while inside the temple. The 370 steps going down to the temple was excruciating even with the lovely view of rice fields on the way. We were gasping for air when we reached the entrance and needed to stop for a while to sprinkle holy water over our heads; Made showed us on how to do this cleansing part. 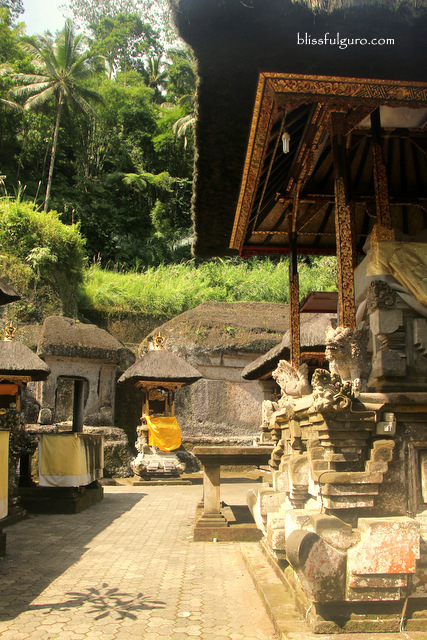 Gunung Kawi Temple is a collection of ten candis (shrines) that were designed to provide a dwelling place for the souls of the ancient kings. 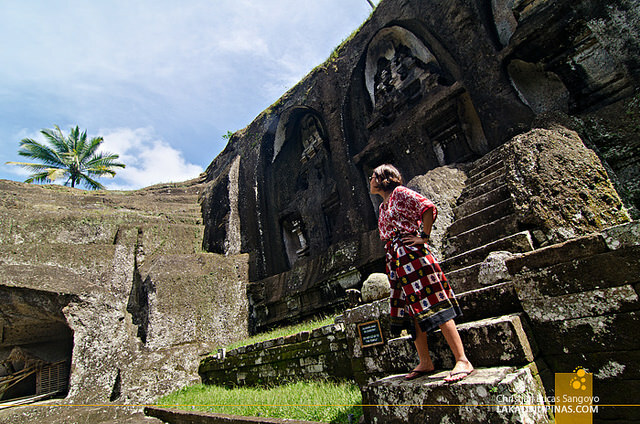 The shrines were carved from the walls of the valley (solid rock) on both sides of the Pekerisan River thus, providing the perfect background for the temple complex. The inscriptions on the shrines indicates that the date of construction started at around 11th century. 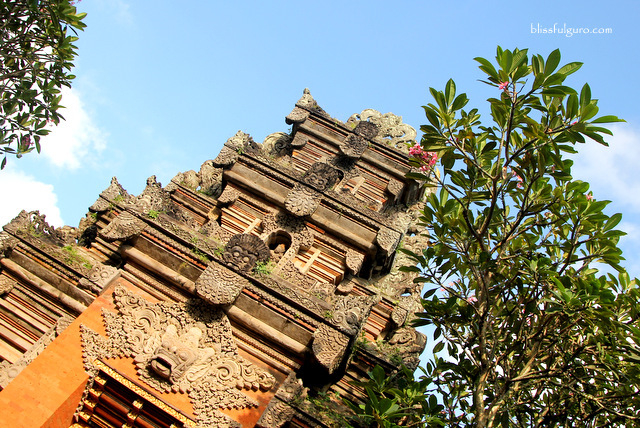 It is believed that each of the carved candi served as a memorial to a glorified royalty mainly because it was shaped like burial towers, same as the ones found in Central Java. Moving on, we crossed a bridge over the Pekerisan River going to another set of candis. 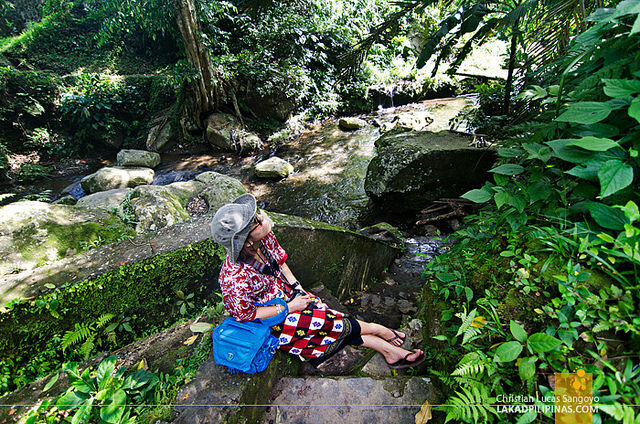 It is believed that the holy waters from the river sanctify the Gunung Kawi. After crossing the bridge the group scattered. One went to the river and the other took a hundred or so photographs while I was lost in the middle of the huge rock sculptures. I love this temple, I kept on whispering to myself. 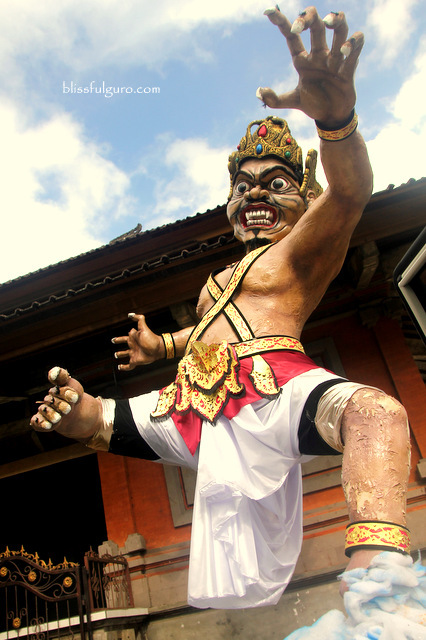 This is one proof of the Balinese’s artistry that stood over the test of time. 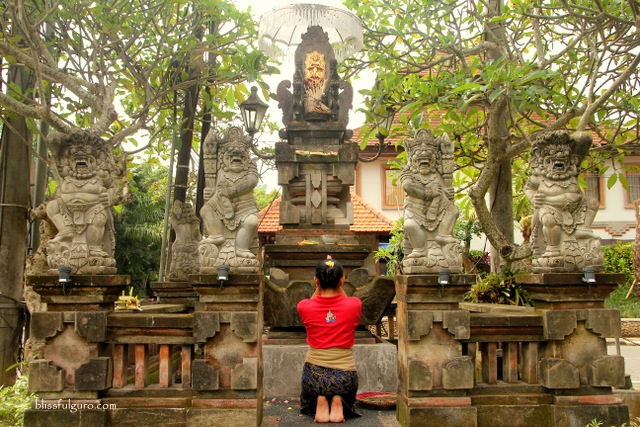 I also loved how deserted the place was compared to other temples in Bali. Made supposed that it’s because of the strenuous climb on the 370 or so steps (it felt like a thousand though). And we were all panting and sweating buckets on the way up. It’s really hard work but all worth it. After our Gunung Kawi stint, Made asked us if we wanted to visit the Monkey Forest and gave him our loudest No response of our lives. 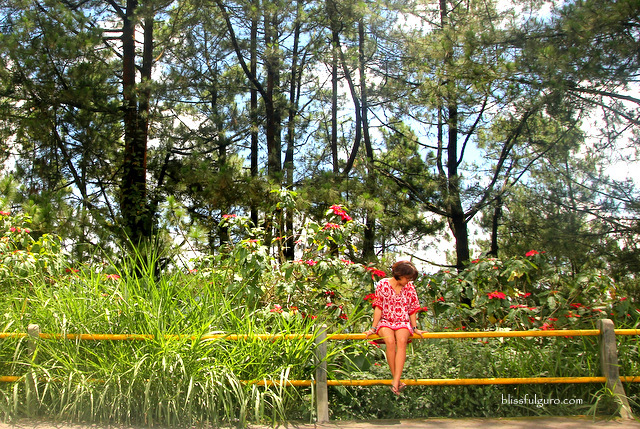 It was evident that we were dead tired after doing some hikes that day (we don’t dig hiking and trekking that much). 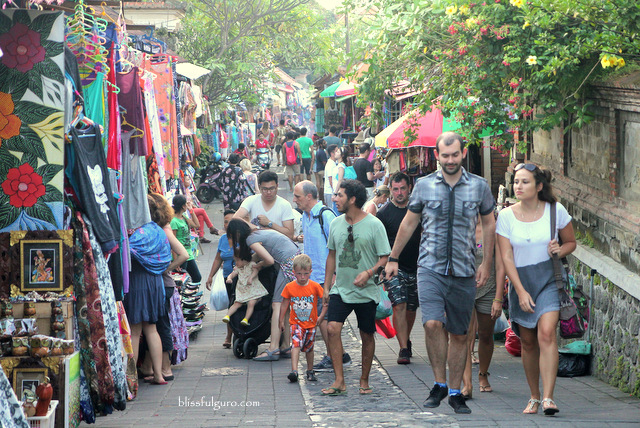 We asked to be dropped off at the Ubud City Center to check out the market which we heard was one of the oldest in Bali. Made wanted to wait for us but we insisted that we’d just ask for our resort’s free pick-up service. 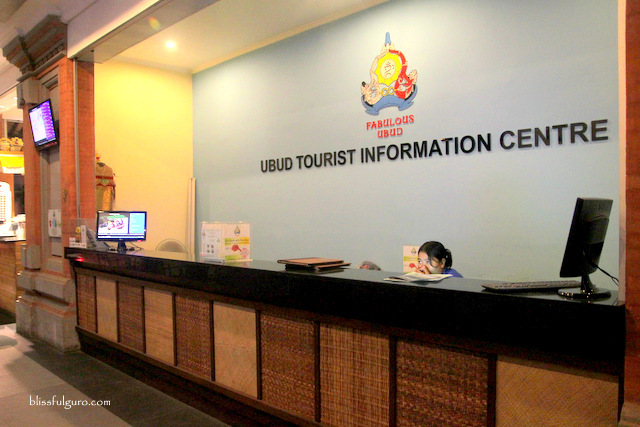 He directed us to the Ubud Tourism Information Center where they helped us contact Bebek Tepi Sawah Villas and arranged the pick-up later that night. Before checking out the market, we visited two temples at the city center. 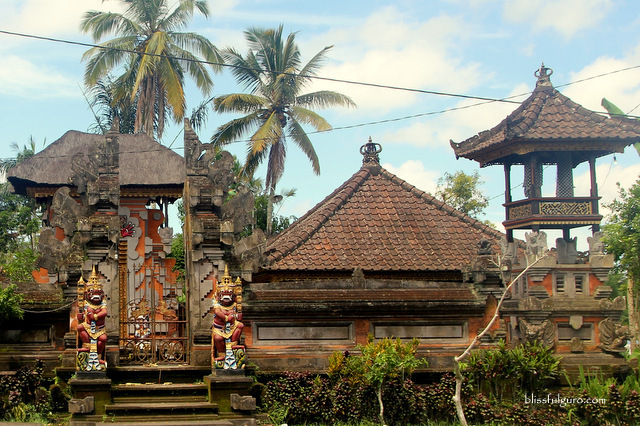 First was the Puri Saren Ubud (Ubud Palace) which was the former residence of the royalties in Ubud and then the Pura Taman Saraswati which is dedicated Deri Saraswati, the goddess of wisdom and the arts. Just a quick stopover at the gates and off we went to Ubud Market. 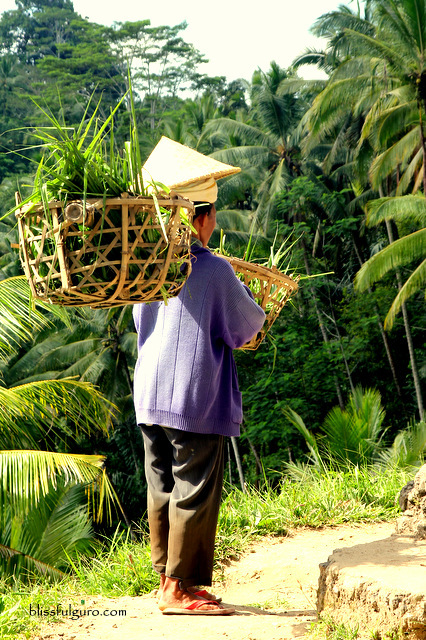 The roads leading to Ubud Center is lined with nice boutiques, art galleries and cafés that made the whole community a perfect place for a walk. Nothing’s grand, the shops were all small and unpretentious. 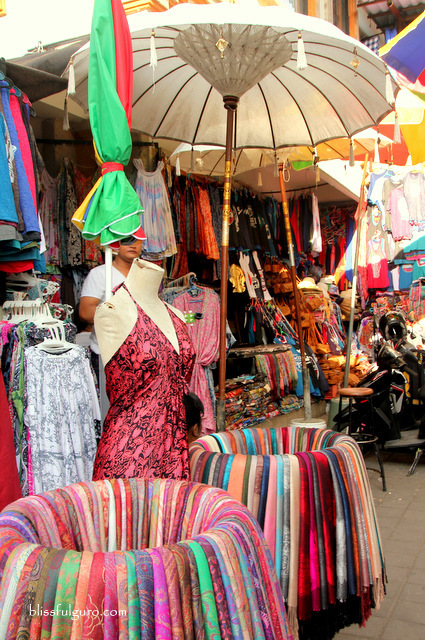 But the highlight of the city center is the Ubud Market, one of the best shopping places in all of Bali. Located at the corner of Jalan Monkey Forest and Jalan Raya Ubud, Ubud Market is a two-storey building that houses different stalls with batik shirts, sarongs, wood carvings and other knickknacks that specifically target the tourists. The outside roads bordering the market are also dotted with boutiques and shops that are more artsy. To get the best deals, you have to have the best bargaining skills when shopping. It has been a fun and very exhausting day and we needed to cap it off with Bintang Bali Beers. We so love our unstructured and spontaneous plan and also our guide, Made, who taught some basic Balinese words in exchange of few Tagalog phrases. And wait till I write about the food hunt we did in Bali, everything was really enak (Google translate now! ).